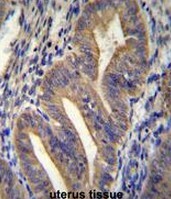 LOC399818 MaxPab polyclonal antibody. Western Blot analysis of LOC399818 expression in human kidney. 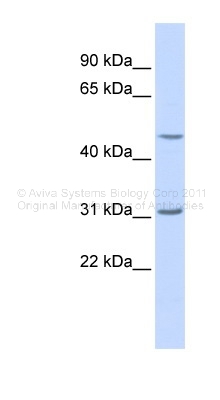 Western Blot analysis of METTL10 expression in transfected 293T cell line (H00399818-T01) by METTL10 MaxPab polyclonal antibody.Lane 1: LOC399818 transfected lysate(21.12 KDa).Lane 2: Non-transfected lysate. METTL10 Antibody (N-term) (Cat. #AP52673PU-N)immunohistochemistry analysis in formalin fixed and paraffin embedded human uterus tissue followed by peroxidase conjugation of the secondary antibody and DAB staining.This data demonstrates the use of METTL10 Antibody (N-term) for immunohistochemistry. Clinical relevance has not been evaluated. METTL10 Antibody (N-term) (Cat. 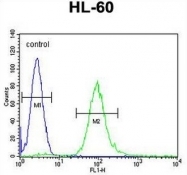 #AP52673PU-N) western blot analysis in HL-60 cell line lysates (35µg/lane).This demonstrates the METTL10 antibody detected the METTL10 protein (arrow). METTL10 Antibody (N-term) (Cat. 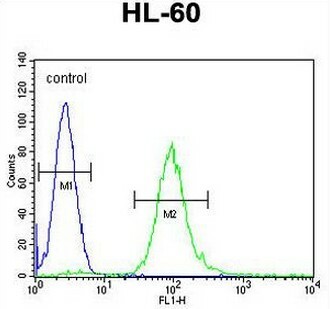 #AP52673PU-N) flow cytometric analysis of HL-60 cells (right histogram) compared to a negative control cell (left histogram).FITC-conjugated goat-anti-rabbit secondary antibodies were used for the analysis.